My son and a family friend, who was visiting with us. 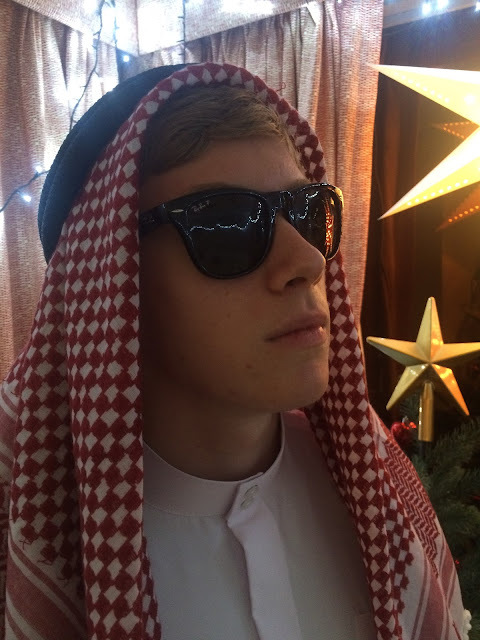 Our friend is studying in Oxford, England this year, and came to see what Qatar was all about--trying to "open his sky." 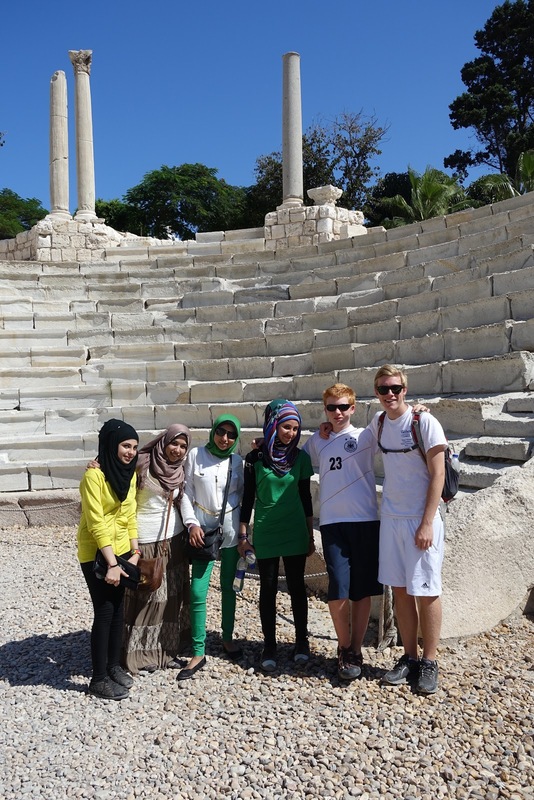 What's it like to attend a school that comprises 72 nations in the student body? My high school senior is finding out. Last week they had an International Week where everyone was able to wear their country's clothes, bring ethnic food, and celebrate at a flag ceremony. Because he is rubbing shoulders daily with students from ever corner of the world, I know his life will never be the same again. For example, one of his good friends is from Sudan--a place that before had seemed so far away on a map. There was a flag ceremony, almost like the Olympics, where the students carried the flag of their country. South Africa was represented by two students--one was black, and other one was white. I was inspired by the respect, courtesy, and acceptance that was exhibited as each country carried their flag down the aisle. Everyone cheered for every flag--all 72 of them. Every child brought food from home that represented their country. Since I am Icelandic, I appreciated that my heritage was represented from the lone student from Iceland. A Canadian teacher dressed up for the occasion. Platters of rice and lamb at the Middle East table. 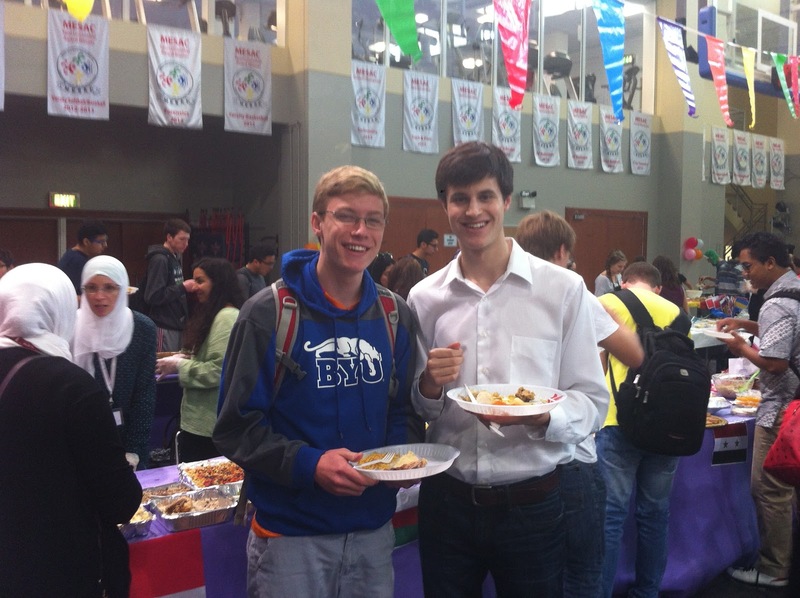 The Middle East table with an abundance of Arabic cuisine. The little girl in the middle is dressed up in Qatari traditional wear. All the kids dressed up for the holiday. The adults even dressed up, from almost all the 72 countries. These are Danish moms serving the food that day. The Greek moms started folk dancing to Greek music, and belted out a few 'Ompas' to the crowd as we clapped to the rhythm of the music. The Asian section where they were making sushi! My other son at his International Week with our neighbor and friend. For a new expat in this country, it has been tremendous fun to see the excitement stirring here in the last few weeks for National Qatar Day. It is a holiday that celebrates the unification and independence of the new nation of Qatar. Buildings and homes are draped with huge flags, children are dressed as soldiers or in the colors of the flag, which are maroon and white. 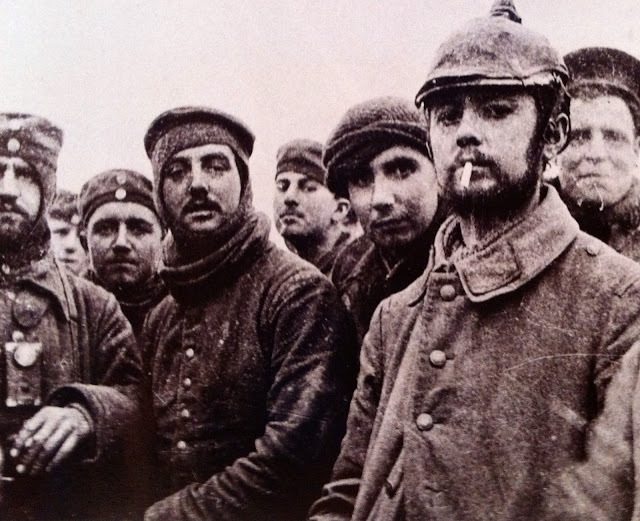 There have been exhibits, presentation, parties, parades, fairs, and fireworks for a couple of weeks as a drumroll for the celebration on December18. Interestingly enough, if you venture to the mall or expat compounds, you can even view Christmas trees and lights intermingled with the Qatar National Day festivities. Indeed, it has been a very merry interlude before we celebrate Christmas in Qatar. We went to a fair one night to view the traditions and culture of Qatar. Falconry is a huge sport in the Gulf. The falcon's cage was in the little hut covered with hay. Of course, all the little boys wanted to climb in. We are listening to the translator tell us about the ancient tradition of falconry. The old falconer to the right is telling how for centuries people have hunted with falcons. They are indeed prized birds, and sometimes can fetch up to tens of thousands of dollars. Young boys in our neighborhood who are playing soccer in front of this mosque, all of them barefoot. Everyone has been in a celebratory mood--lots of food, sports, parades, and being with family and friends. A two-story high flag hung on a pre-school--two stories high. The Qatari flag is ubiquitous in this country in the last weeks. Today I saw cranes ten stories high with the Qatari flag waving boldly in the faint breeze. A home wrapped with Qatar flags--showing great pride in their nation. One of the favorite pastimes in Qatar--going to the camel race track (another post that is coming up). There were flags and banners everywhere at the track. At Ikea today with Qatar flags everywhere. A Qatar flag in front of the grocery store today. 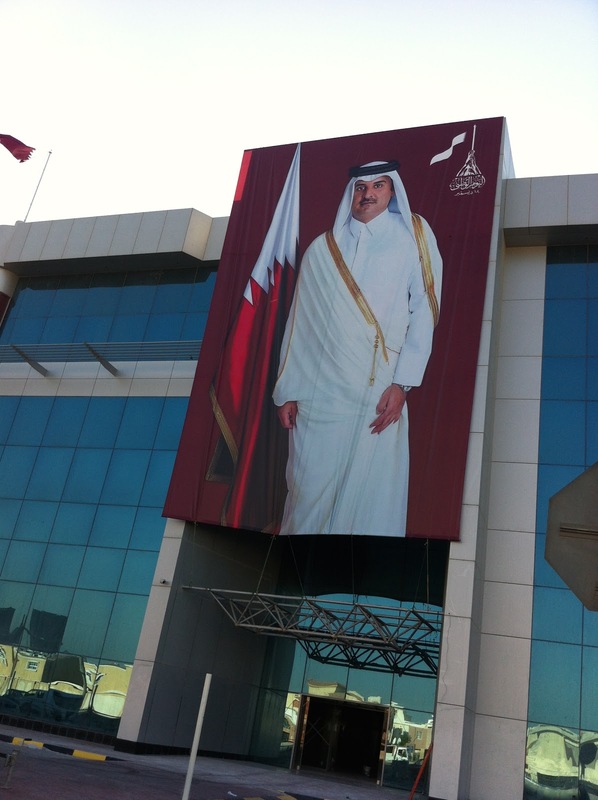 The Emir's picture is everywhere--on posters, cars, clothes, banners. A Bedouin tent that was on display where men were listening to music, drinking coffee, and socializing. 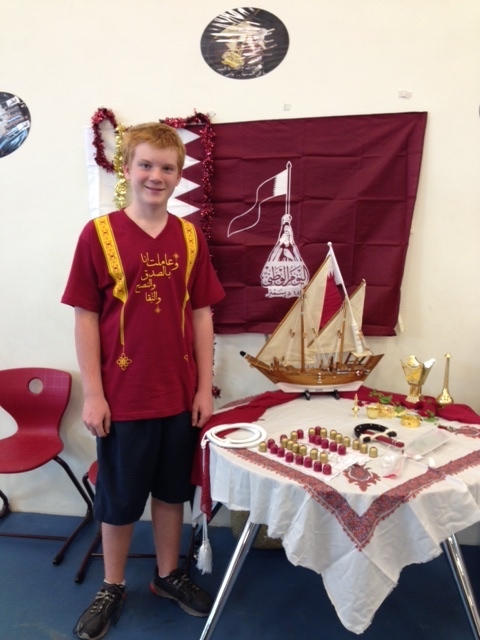 My high school son dressed up for Qatar National Day. We waited in line at the fair about 45 minutes for the Qatari version of french fries. They slice one potato with one curly cut, fry it on a stick, and put whatever condiment you desire. Z. and P. anxious to try some Qatari fair food. E. with his friends at school who are dressed up in their country's apparel. The t-shirt was given to E. when he was doing archery at the fair the night before. 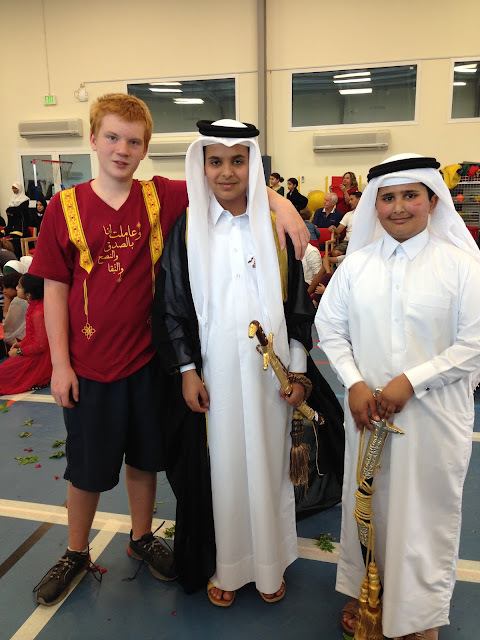 All the kids were encouraged to dress up in Qatar dress. We tried our best to be patriotic to the country we are living in now. A pearl boat representing Qatar's economy before oil was discovered. I heard a lot of Americans say National Qatar Day was the 4th of July on steroids. We ended the day up on a rooftop to see a fireworks extravaganza. I must say the Qatari enthusiasm, pride, excitement, and love for their country was evident everywhere. You should come next year to see for yourself! Dr. Maie in her classroom with my son. Whenever I have an initial visit with someone who will work with my son who has autism, my head brims with questions. A few stray, clingy apprehensions rise up. Will this person see the intentional humor behind his occasional antics? (Actually, he can be very funny, and has a great wit). Will they try to understand the deeper message he is trying to communicate that is sometimes masked by repetition and silliness? Will they try to look beyond the label of autism--peel off the layers, so to speak, so they see the loving, inquisitive person who I know? The first time I met with Dr. Maie, she immediately quieted any residual fears. 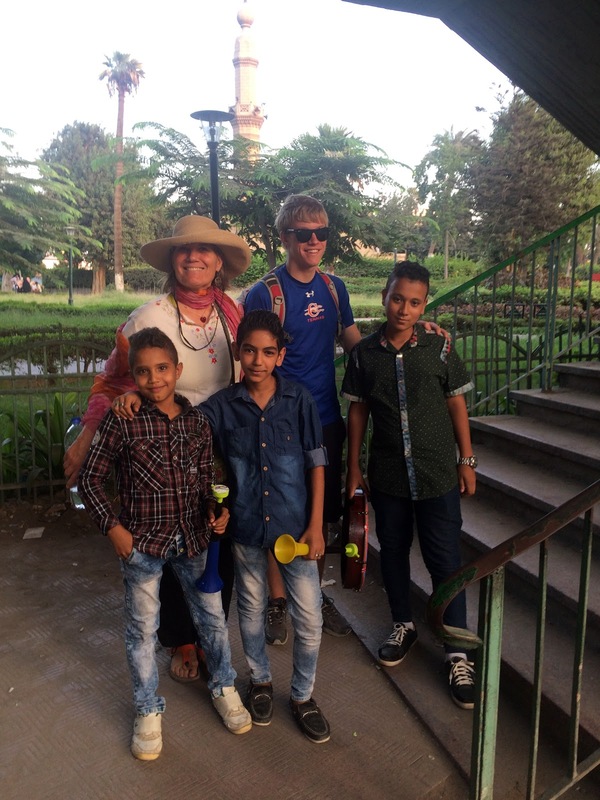 As I sat across the table from her, she explained, "I trained as a pediatrician in Egypt, and practiced for a few years. But when I had a child with learning difficulties, I decided to change course. I studied special education in London and in Washington D.C. so that I could understand how to work with my son. You see, I know what it feels like to sit across the table with someone, a stranger, who will work with my child. Believe me, I know how you feel." She continued, "I know your son can decode any book, but he struggles with comprehension. I have a program that I believe can help him, and I have used it for many years with my students. If we both work together, I think we can make some big strides. I want you to know that I will treat him as my son. When I look across the table at him, I will see my son." As she spoke, a tear welled in both of our eyes. It was a moment of grace and revelation. I knew I was in the presence of a remarkable person--someone who had experienced intractable pain, but had deliberately transformed her life to alleviate others' suffering. She had forged another trajectory path to understand her son's journey, but in the process had given other children, without a voice, the gift of reading. To know profound loss, and then to give anyway reminds me of a quote by Elizabeth Kubler Ross: "The most beautiful people we (I) have known are those who have known defeat, known suffering, known struggle, known loss, and have found their way out of the depths. These persons have an appreciation, a sensitivity, and an understanding of life that fills them with compassion, gentleness, and a deep loving concern. Beautiful people just don't happen." Sometimes in my moments of unease or anxiety about my son's autism, I remember the incredible people who have shown understanding and compassion along the way--people who have made all the difference, even if it was only an encouraging word or smile. I have to admit the autism journey has given me a front row seat to view some amazing, beautiful people. They have not only tutored my son, but have instructed and shaped me as well. The journey is not what I would have ever sought, but I feel so very blessed. My son during his reading time--learning to "comprehend" more and more all the time. Any kind of moisture is a precious commodity in the Middle East--whether it is a wadi/oasis, well, or a precious drop of rain. This last week the children in my son's school who take Islamic Studies prayed for rain. These prayers mirror centuries of their nomadic ancestors. I was told by my Arabic friend today that Muslims have been praying for rain here recently, and to have two rainstorms in one week has added to many children's jubilance--including my own inner childlike joy. A local artist's rendition of a desert oasis. Believe me, these scenes are few and far between, but we are constantly on the lookout for them! Today I was with some young children, and one of them excitedly exclaimed to their mom, "Look, Mom, it's raining. See the drops," as he looked up to the sky. You see, when you live in Qatar, raindrops are a marvel, a heralded event, a reason to celebrate. The mom, my friend, was in a hurry, and replied in an incredulous way, "No, honey, it's not raining." But her four year old son insisted, "But Mom, it is too raining. If you can't see it looking up, look down." He was indeed right. A minute later we saw some flecks of rain sprinkled on the street and wet polkadot craters in the sand. A little misty drizzle was swooping in to give us a surprise in this place--where the blazing sun could make a desert lizard want to be a tropical one. There was a leap of uninhibited joy from all of us, just from mere sprinkles of water in this arid land. I planted bougenvillas to climb the gray, plain walls. In our "compound" pool during the rainstorm, there were children drenched from the sky as they swam--even puddles are an ever so thrilling sight here! What used to be for me a very normal, ordinary raincloud is now a cause to awe. These past weeks the rain has reminded me to look for the delightful, the humorous, the beautiful in the everyday routines and rhythms of life. As Mitch Albom states in his book, One More Day, "You can find something truly important in an ordinary minute"--where the ordinary transcends to the extraordinary." My experiment these past weeks to discover the beauty in the common, everyday sights has reminded me of the color and grandness in this part of the world. It is teaching me to be watchful for the exceptional that can happen in a split second--while knowing that I have to awaken my senses and awareness of the world around me. The pleasure of a desert sunset, the burst of a blooming flower, the marvel at watching young men learn to swim are all things that make me feel more alive, more happy. 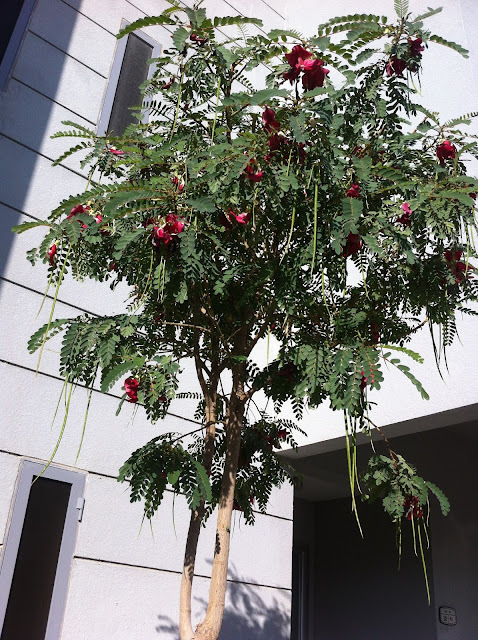 The flowers blossoming on the trees in Qatar now. We adults need to strive to maintain that curiosity, surprise, and awe that heightens our souls. I think it is one of the gifts of never growing old--internalizing the wonder and intrigue around you. It is viewing with the eyes of a child that anything extraordinary can rain down upon you anytime--even when you live in a desert. 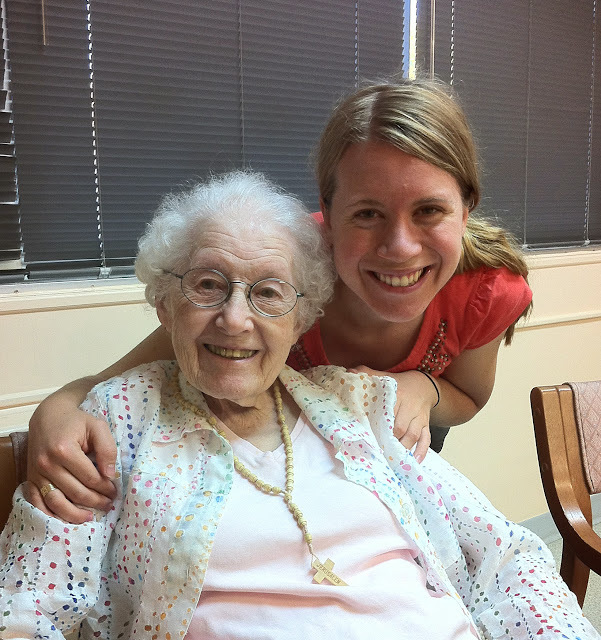 This is my daughter's piano teacher, Sister Alice Eugene Tighe, who is 98 years old in this picture. She received a Ph.D in music at University of Michigan and studied in France. She climbed into our van several times in her mid-80's to go to piano competitions that crossed several states. Her excitement for learning, and teaching music never escaped her--until her last breath. She instilled a love of music to several generations of students--even sending a few off to Julliard. I never saw her without a thirst to learn more, and then to share. The world was endlessly fascinating to her. At the Souq Watif, the open air market in Qatar. I was pleasantly surprised the grocery stores offer entire aisles of spices and herbs. 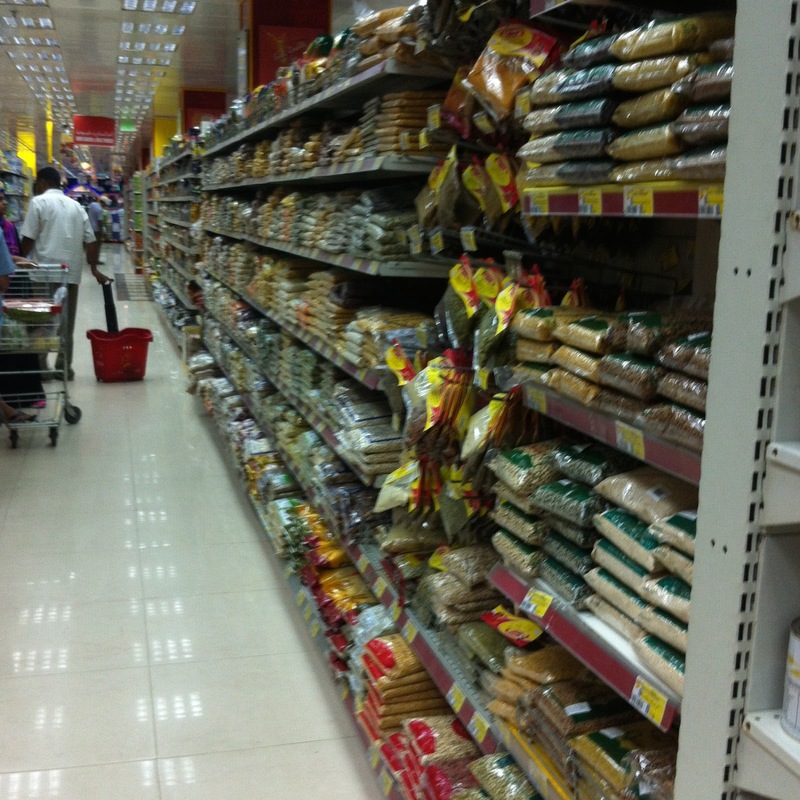 You can buy many kinds of herbs to plant in the grocery stores here in the Middle East. 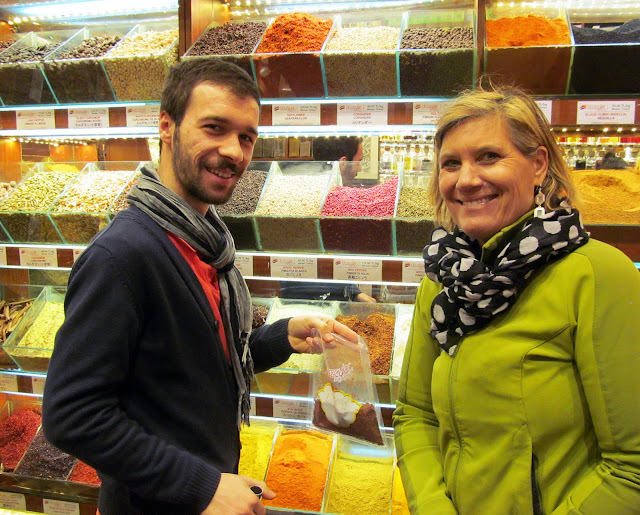 If you are a person who enjoys the pungent, fragrant flavors of spices and herbs, the markets and grocery stores in the Middle East offer a seemingly endless assortment of choices. It is easily apparent that spices and herbs in their every variety are tremendously valued here. I feel I have more of a connection with a place when I understand the spices and herbs they use--whether it is for their cooking, medicinal use, aromatic smells, or even to view their vibrant colors. My own assortment of spices and herbs is akin to someone else's prized antique collection; I am always on the prowl to discover a new piquant flavor to add to my collection. Since we have moved to the Middle East, I am even on more of a quest to capture new savory combinations of spices and herbs. Interestingly enough, I have found that it is a delightful way to enter into conversations and meet new people from other countries. Some friendships have even developed because some people sense my genuine interest. Strangers have shared recipes, childhood memories, and even old family stories that are conjured up by memories of herbs and spices. Tonight at a dinner party at a friend's home in Abu Dhabi, Dana, a woman from India, immediately became enthusiastic when she talked about spices. She told us that many Indian families have their own secret combinations of garam masala and curries. Her eyes lit up with fond memories of cooking with aunties and her grandmother--stirring and blending the fragrant, warm, and sometimes sizzling spices (reminding me of the movie, The Hundred Foot Journey). http://www.youtube.com/watch?v=yEO1TWeM5JU One could almost smell the curry drifting through the window as she spoke. Dana told us all, as she flipped her long gorgeous hair back, the benefits of spices--of health, and beautiful nails and hair. The women all sat in attention as she spoke since we knew she had been a popular TV Indian actress, and had done hair commercials in India. Another guest, Mailyn, a Chinese woman from Malaysia, recounted about going to the markets with her grandmother who was known in the area for her expertise in cooking and mixing spices. She said, "My grandmother would take me to the market to buy the whole spices, (like cardamon, ginger, hot chilis, cloves, etc) for her curry, and then we would dry them outside on reed trays in the yard. Since we lived in a tropical place and it would rain almost every day, she would then yell to her grandchildren, 'Go save the spice trays, kids, it's raining.' "
Mailyn continued, "The grandkids would gather the precious spices, and then I would volunteer to go with my grandmother to grind them by a skinny Indian man in the town. Since we lived in a tropical climate, I remember he only wore a small loin cloth. Spices of every color covered his skin, and I remember choking in the room with the hot dried chiles, but he was accustomed to it. My grandmother was quite famous in the area, and would then bring home the spices where she had a cottage industry of mixing them together. About ten of her grandkids would sit on the floor with small bags, and we would mix the secret blends, and then with a candle, seal the bags. We cousins chattered happily, not knowing the rich heritage of food that our grandma was giving us." 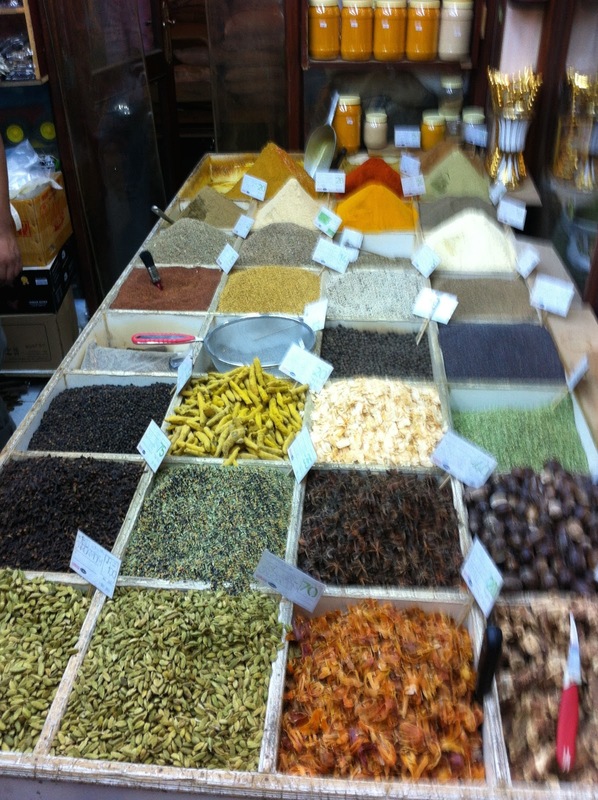 I have discovered spices and herbs somehow bring to the surface some of the fondest memories of our early lives. With the sense of smell, perhaps our most under appreciated sense, experiences come back with pleasant, and often times tender recollections. Simple sights and traditions from our past weave together again. Perhaps this is the reason I try to not only savor my own memories of herbs and spices, but to discover others' tales. Spices and herbs offer me the chance to experience in a direct way another culture or family story. Sometimes my own kitchen's aromas are like a global tour of different countries. Depending on which day you come, you could be in India, Morocco, France, China, Mexico, or somewhere in the Middle East. I believe you widen your own sky when you partake of food from other countries other than your own-- especially when creating new flavors. It is an inexpensive way of exploring and discovering: awakening new pleasures, enhancing healthy food, and perhaps the most important, building memories with your loved ones. Getting a new recipe in an Istanbul market. Here is a fall recipe from my daughter who is a dietician. Note: I have even made it two times this week. I used the Iranian pumpkins that we used for Halloween that were on my front porch. (You can see the photo of them before they were "soup" in the post called "My New Pumpkin Patch). Saute butter, oil, onions, and curry powder together in a large stockpot that is uncovered. Stir until onions are tender. Peel squash and cut up into chunks, along with the cored apples (I leave the skin on them). Add the squash, apples, salt, pepper, cider, and water to a boil. Simmer to a boil, and cook over low heat for 30-40 minutes until squash and apples are soft. Puree squash mixture with immersion blender or food processor. Add salt and ground pepper to taste. We added a dollop of creme fraise that was tasty! Enjoy! Happy Thanksgiving to all! One of the huge assets about being an expat is the ready opportunity to travel-- to go places you never imagined you would visit. Also, to make it even more enticing, students get some extended holidays off from school that we certainly did not receive in St. Louis, MO, USA. Like us, most of the expat population at Eid were exiting the country for holiday excursions. Since we dwell on this small peninsula off the coast of Saudia Arabia, it was the perfect time to escape the lingering summer heat. Typical of us Shums, we had not made any definite plans or bought any tickets for the Eid break--that was only about three weeks away. To be fair, we had just barely arrived and unpacked in our new home in Qatar--plus started at new schools. But there were two looming questions: where were we going for the Eid break and when would we buy the tickets? Now I am glad I came! 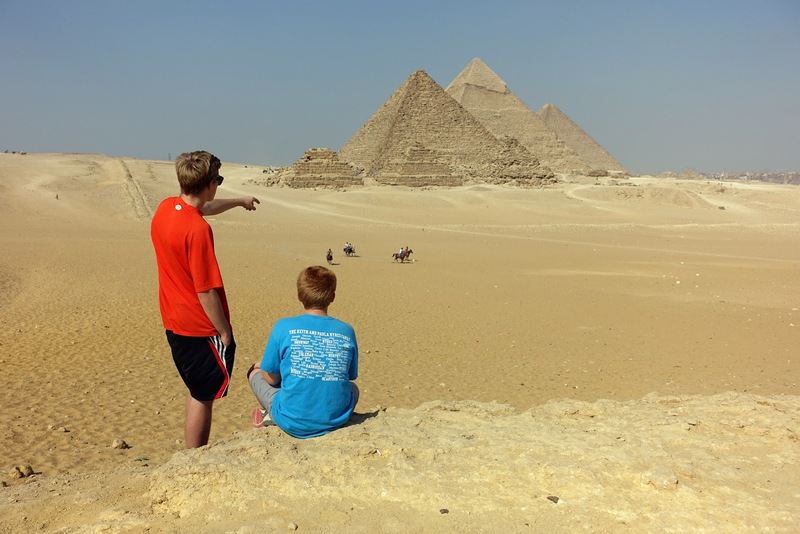 We finally decided on Egypt since my husband grew up ravenously reading about ancient civilizations and archaeology and my son wanted to see the pyramids. Frankly, there were not many other local options. Egypt was definitely not on my agenda. I wanted to escape the burning sun, and see some lush, green forests--perhaps even feel some moisture? However, as is often the case, this new place and peoples began to penetrate my affections on the very first day; a whole unknown world opened up. 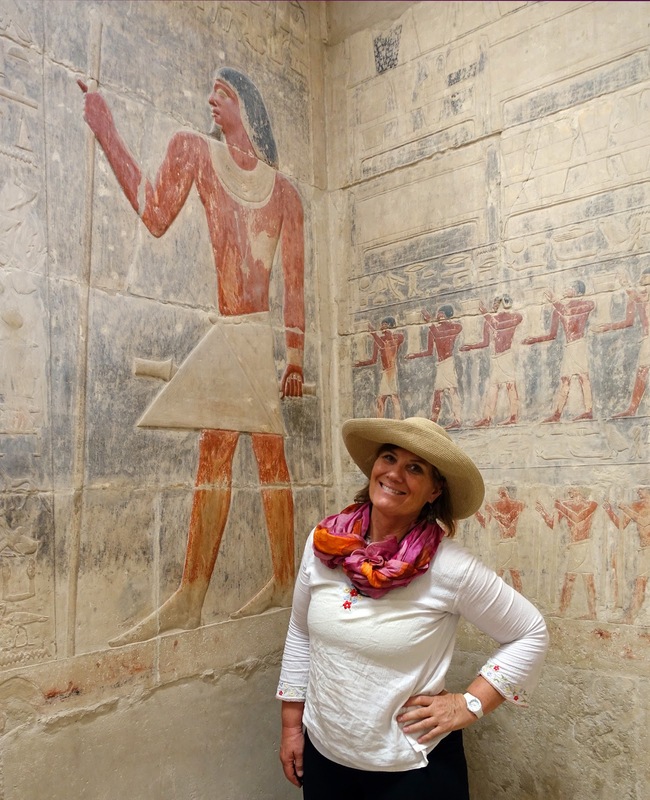 I became entranced with Egypt--the place that scriptures, literature, expeditions, crusades, wars have been intertwined with for millenniums. Amongst the noisy, bustling, even cacophonous crowds in Cairo, and the peaceful villages along the Nile, this place pulled at my heart. I have to admit I even felt at home. There was a young, handsome, religious taxi driver named Makmud (about age 32) who was my favorite person we met in Egypt. I can't find his picture. He was our taxi driver for several days when we went to the Red Sea and Alexandria so we had time to talk. His English was adequate, he had gone to college, and was expecting his third child. His father had died when he was young so he took care of his mother in a seven story walk-up apartment. When it was time to pick a wife, he asked his mom to arrange it for him because he was in India working. His mom found a beautiful girl, he said, and she knew this young woman would make a wonderful wife. His mom and wife called a few times on our drive--checking up on him. He didn't seem to mind, and said his favorite thing to do was to go home and talk about his day with his wife. He drove us by his apartment, and we could see it was a very humble dwelling, but there was so much love, devotion, and kindness evident in his phone calls and family stories. 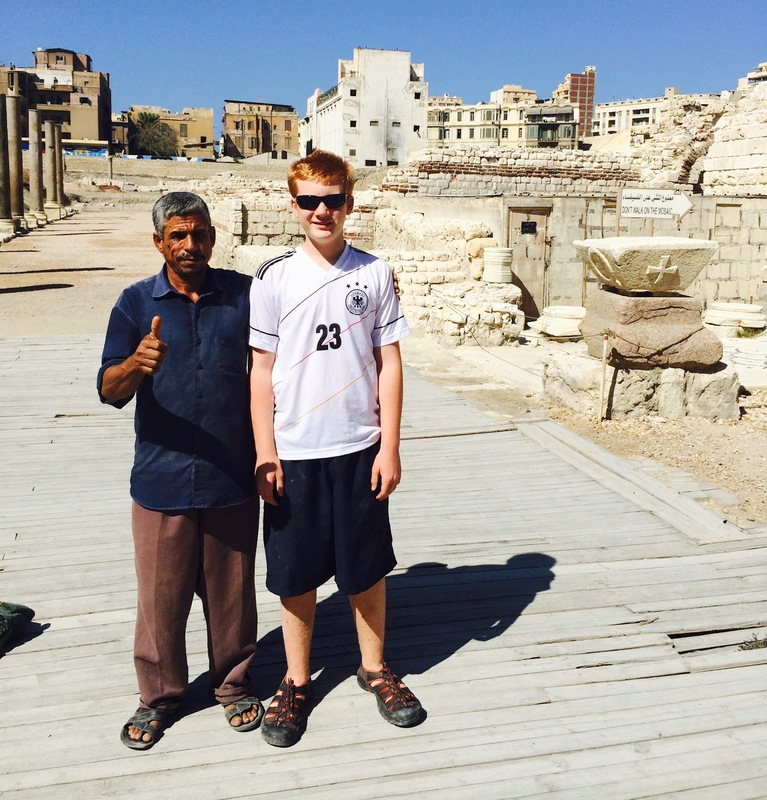 Here is another Makmud, an Egyptologist and our tour guide. He told us that Egyptians prefer to see the glass half full, even with the struggles they have been going through. When the water shuts down in their homes, they go to the mosques for clean water. He said, "The mosques always provide for us in the neighborhood." See the horns the boys are carrying? I will tell you that I have never heard such loud noise to celebrate Eid and National Egypt Day, which was on October 6. One British diplomat we met said, "I needed earplugs for my earplugs." Our tour guide said, "When Egyptians are loud, that means we are happy." Since it was Eid, women were selling flowers everywhere so people could take them to their ancestor's graves. My boys talking to some kids about sports. Tourists are not as ubiquitous as they used to be in Egypt, and we were sought out many times to talk and pose for pictures. We stumbled upon this woman named Maie, and she taught me how to make flat bread. On a Nile River cruise one night when much of Cairo was blasting music, dancing on boats, blowing horns, and celebrating the week of Eid, we met a group of Indian Christian pilgrims on the deck. They were on their way to Jerusalem the next day. This is a picture of a family from the southern part, Karola, the section where most of the Christians live in India. They had saved a long time to be in this group with people who shared their same faith. The group's Christian songs in Hindi inspired us for days. After being with them for a few minutes, we were invited to India. This is a picture outside the new Alexandria Library, about two hours from Cairo. The first Mime School in Egypt was established recently, and these are some of the students performing outside the library. Egyptians, we found, are extremely fun loving, affectionate (they always kiss you on both cheeks), and witty. They prefer to not see life too seriously--having fun along the way. For this reason, we felt at home--even when we were the only tourists around, which was most of the time! This is a guard at the Roman Amphitheatre in Alexandria, Egypt. E. (my son with autism) was climbing on a wall, and the guard got a little nervous for his safety. He came down, and lovingly steered him away, even with only speaking a few words of English--no anger, just love. 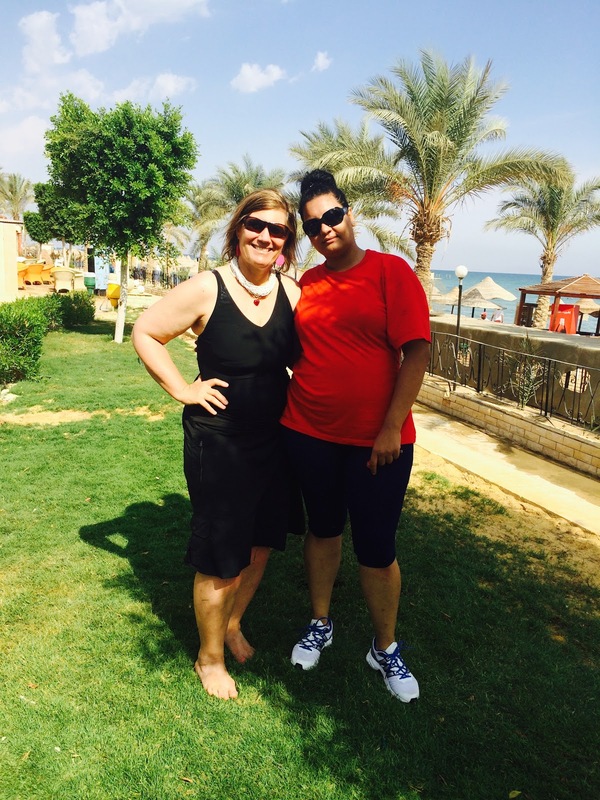 At the Red Sea Resort where we were for one day, Latifa led exercise classes, and ran the spa. Her boot camp was fun, even though she could only drum up a few middle school girls and me to come. She lives near Giza, and she said the view out her bedroom window is... the pyramids. She is 31, and lost both her parents in an automobile crash when she was in her early 20's. Auto accidents are the leading cause of death in Egypt. She is resilient, funny, and motivating. She kissed the top of my forehead when we were done with boot camp. These are cousins who run a family perfume business that started about 100 years ago. He told us about his great-grandfather who began harvesting flowers to make perfume. You can see the beautiful glass bottles in the background. Since I like to mix spices together, I thought it sounded like a delightful business--to tend lavender fields, and smell lotus, roses, hibiscus, and other flowers all day. They were very proud of the business their ancestor had started, and showed us old family photos of the flower fields. Here is pictured a woman who has lived in Africa for several years, and hails from Alabama, US. Her work is with human trafficking. She has done much to alleviate this abdominal problem in our world in Africa and Asia. My son said he could have talked to her all night about her experiences. My sons had more photo ops than they would ever have imagined. 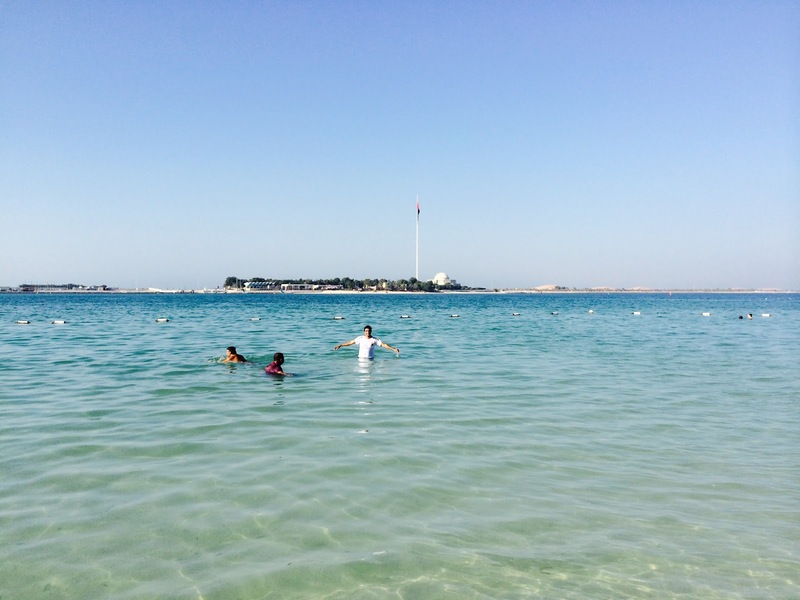 Families were fishing, swimming, and picnicing on the week of Eid. While the apple harvest is going on in Europe and North America, the Middle East is harvesting dates. They are burning the branches that hold the clusters of the dates. 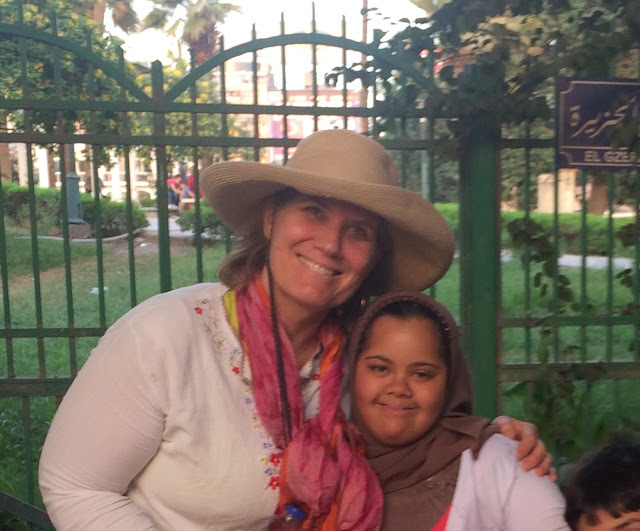 Maie is a 16 year old girl with Down's Syndrome who was walking around at Eid with her family. Since one of my best friends has Down's Syndrome, we started talking, and became friends.